No one can say Bo Russell didn’t put in the work for his monster deer. He sweated, fretted, worked, worried and grieved over the buck for more than three years. Elation and relief finally arrived on Nov. 8, 2012, when he dropped the deer on his hunting plot less than 10 miles from his home in Sperry, Iowa, in the southeast corner of the state. For his efforts, Russell’s deer earned the nation’s highest score (239.36) in the Adult Bow Nontypical Division of the Outdoor Channel National Deer Contest powered by BuckScore, the nation’s first whitetail deer scoring and photography competition. The contest ended Jan. 31, but hundreds of examples of the finest deer in the nation can still be seen at nationaldeercontest.com. 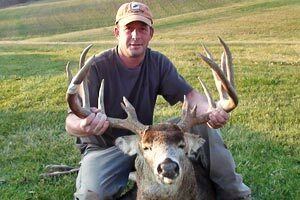 Russell’s buck, a 6-year-old 19-pointer, eluded him and others in the region for its entire life. For Russell, the pursuit of it nearly became an obsession. Russell first saw the deer when a trail cam caught images of him in 2009. For the 2012 season, Russell first put his cameras out in July. But the big buck never appeared until Oct. 8, shortly after the start of the local bow season. Russell’s hunting area was a tree farm of 60-70 acres with rows of pines and oaks that were about 20 years old. Adjacent to the plot on one side was a farm where corn had been harvested prior to the 2012 season. Russell said he saw the buck on cameras in the area, but his appearances were erratic – at least once a week, but not every day. He had his first real chance to bag the big buck on Halloween weekend. “I grunted him in, but he hung up about 40 yards out,” Russell said. “I was upwind of him, but somehow he smelled me anyway. He stuck his nose in the air and smelled me. Then he snorted and blowed at me, and then was gone. A few days later, Russell saw the buck again. This time he came out of a stand of pines into a field, where he spent about 45 minutes pushing around several does. Russell watched from about 80 yards away. The frivolity continued until dark, and then the group moved back into the woods, not far from Russell’s stand. “It was well past shooting hours, but there was a full moon and they moved through right under me,” he said. “There was no way I could have shot. Russell continued to hunt the area hard each day after work for the next week- and-a-half, but he never saw the buck. A few days later, on the adjacent farm land about 100 yards from Russell’s stand, some heavy equipment was brought in to do some excavation work. So on the afternoon of Nov. 8, Russell elected to park his truck in a different place and enter his stand from a different route. The buck was headed toward a shooting lane that Russell had measured to be 49 yards from his stand. But there was a fork at which he could continue toward the 49-yard shooting mark or head into another area. He continued toward the shooting area. “It was probably 10 seconds from the time I saw him until I had to make a decision on the shot,” Russell said. Russell shot and watched the buck go down in a pine thicket, 30 yards from the spot where he was hit. Russell wasn’t the only hunter that the big buck evaded. A few days earlier, a gentleman missed him on a parcel of land to the south of Russell’s. Also, a woman shot him in the shoulder during the 2011 season.